Home Editorials What if the Children Dying in Gaza were Jews? Let’s do a thought experiment and imagine that the Arabs had gotten the better of the Israelis in the 1948 Arab—Israeli War and after years of conflict, all that was left of Israel was the Gaza strip. 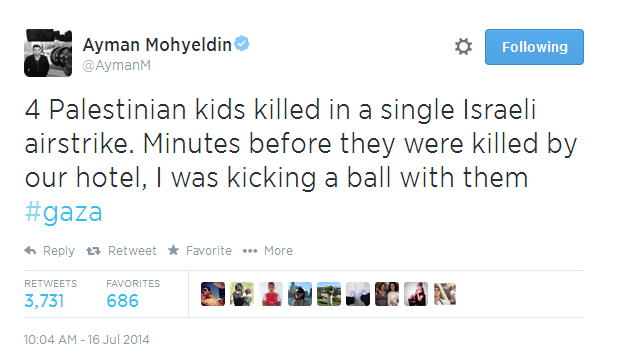 NBC correspondent Ayman Mohyeldin reported first hand the death of four boys playing on the beach in Gaza. “The attack – and its heartrending aftermath — was witnessed by NBC News. Moments earlier, the boys were playing soccer with journalists on the beach. The four victims were named as Ahed Atef Bakr and Zakaria Ahed Bakr, both 10 years old, Mohamed Ramez Bakr, 11, and Ismael Mohamed Bakr, 9.” Ayman Mohyeldin, who is Egyptian-American, was later ordered by NBC to leave Gaza. It’s almost impossible to imagine that Mohyeldin would have been replaced if he had been reporting on the death of four Jewish youngsters at the hands of a Palestinian gunboat. What we see repeatedly in Gaza is how the media values Palestinian lives differently than Israeli ones. Scheifer can only blame the Palestinians for ‘provoking’ the IDF. Of course in Europe, the coverage is somewhat more balanced, but Roger Cohen of the NY Times let’s us know what’s behind that. He begins by quoting poet James Lasdun, “There is something uncannily adaptive about anti-Semitism: the way it can hide, unsuspected, in the most progressive minds.” Then Cohen continues, “…the war has also suggested how the virulent anti-Israel sentiment now evident among the bien-pensant European left can create a climate that makes violent hatred of Jews permissible once again.” What Mr. Cohen is saying is that if one applies the full measure of moral outrage towards the Israeli slaughter of children, as the Europeans are doing and the Americans refuse to do, then you are toying with anti-Semitism of the National Socialist variety. A good example of Cohen’s logic at work was when Jimmy Carter used the word ‘apartheid’ to describe the situation in Gaza and was branded “dangerous and anti-Semitic” for simply stating the obvious.